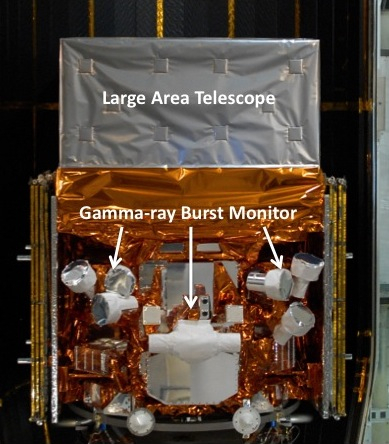 The Fermi Gamma-ray Space Telescope is a satellite observatory for photon energies from 8 keV to over 300 GeV. Launched on 11 June, 2008, it circles Earth every 96 minutes in a 26° inclination orbit at an altitude of 535 km. Fermi carries two scientific instruments, pictured at left: the Large Area Telescope (LAT) and the Gamma-ray Burst Monitor (GBM). Some important performance characteristics are shown below. The observatory typically operates in a survey mode, allowing a scan of the entire gamma-ray sky every two orbits. - Gigantic gamma-ray-emitting structures in our Milky Way galaxy were likely produced by a large energy release from the central black hole several million years ago. - Dramatic flares with sub-hourly variability indicate sites within the inner nebula accelerate electrons to the highest energies associated with any single known cosmic object. - Fermi is the only indirect dark matter experiment to set constraints on Weakly Interacting Massive Particle (WIMP) annihilation down to the limit expected from thermal relics. - Distinctive gamma-ray signature of neutral pion decay confirms the hypothesis that protons can be accelerated to cosmic-ray energies in remnants. New view of the universe! - Factor of 10 increase in known gamma-ray sources from 100 MeV to 300 GeV accompanied by factor of 5 increase in gamma-ray source classes. - Enabled discovery of ~1/3 of all known Galactic field millisecond pulsars, unique probes of neutron star physics and significant additions to those used for gravitational wave searches with pulsar timing arrays.